Across the street from Steaming Bluff and the Steam Vent parking area is the trailhead to Sulphur Banks (Ha`akulamanu). The faluts associated with Steaming Bluff and Steaming Vents extend down to hot rock where ground water is heated and is then released as steam. Sulphur banks results from deep faults extending down to the magma layer where volcanic gases seep out of the ground along with groundwater steam. These gases are rich in carbon dioxide, sulfur dioxide and hydrogen sulfide. Some sulfur gases deposit pure crystals at Sulphur Bank. Other sulfur gases form sulfuric acid which breaks down the lava to clay. This clay is stained red and brown with iron oxide. Visitors with heart or respiratory problems (such as asthema), pregnant women, infants, or young children should avoid this walk. At the summit of Kilauea, many sensory experiences greet the visitor. One that is hard to ignore is the aroma of volcanic gases. Two gases that tend to define a visitor's nasal experience, and that geochemists use to define conditions within the volcano, are sulfur dioxide and hydrogen sulfide. 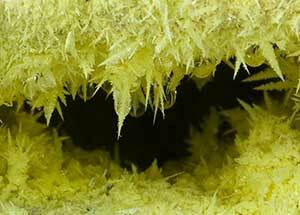 Escaping gases can encrust rocks with sulfur crystals that vary from bright lemon yellow to pale greenish-yellow. Hydrogen sulfide (H2S) is the gas that smells like rotten eggs. Visitors and geochemists alike can sample this gas at the Sulfur Banks area. Sulfur dioxide (SO2), on the other hand, is the biting aroma you smell when you light a kitchen match, or set off lots of fireworks on a still New Year's eve. Currently, it might be known as Kilauea's signature gas. According to a report by the EPA, which ranks sources of sulfur dioxide emissions, Kilauea is the largest stationary source of this gas in the nation. When you stand at the rim of Halema`uma`u, it is sulfur dioxide that gives you the tickling, choking sensation in the back of your throat. In east Hawai`i it is also the component that lends the characteristic smell to vog. Kilauea's hydrogen sulfide and sulfur dioxide gases, though extremely different from each other, are formed from a common source. Their common ingredient, sulfur, is dissolved in the magma deep in the volcano - much like the gas bubbles in soda or beer. In the case of soda, the closed chamber of the can keep the liquid soda pressurized so that the gases inside can stay dissolved. When the can is opened, the pressure is released, and the dissolved gas forms bubbles and can escape. Likewise, as the magma works its way to the surface of the volcano, pressure caused by the weight of the heavy column of material atop it decreases, and dissolved sulfur can form bubbles and escape from the magma. This begins to happen at depths where pressures are about 20 times greater than at the earth's surface. The dominant sulfur product released at the ground's surface is controlled by a complex combination of environmental conditions both within and at the exit point of the volcano. These include pressure and temperature conditions, the type of rock surrounding the system, and the chemical reactions that occur among sulfur-containing substances. The main influence in determining which sulfur species we predominantly experience is the abundance of ground water in the volcano. Because sulfur dioxide dissolves easily in water, a dry pathway to the surface must exist before appreciable amounts of sulfur dioxide can make it to the light of day. Observatory staff witness this phenomenon at the summit of Kilauea, when we see a decrease in sulfur dioxide gas emissions immediately after a ground-saturating rainstorm. Because Kilauea usually has relatively dry gas pathways, an abundance of sulfur dioxide is almost always released. In special areas like Sulphur Banks or the lower east rift zone geothermal area, generous amounts of ground water effectively scrub the sulfur dioxide, and hydrogen sulfide is the dominant sulfur gas. 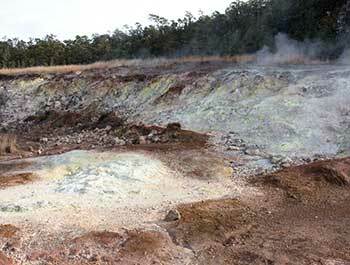 One thing for sure is that whichever gas pathway you choose, sulfur gases are part of the complete volcano experience.